The first book in the Temple Wars series, Ganesha’s Temple is now available on Amazon.com. Rohit Gaur, a serial entrepreneur, has announced the launch of the Temple Wars book series. A project in the works for five years, the series represents a world mythology and politics. 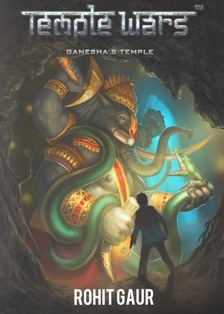 The first book is Ganesha’s Temple, a young adult coming-of-age fantasy adventure. Fourteen-year-old Tarun goes on a spiritual adventure with Ganesha, the lord of obstacles, and mystical deity he has befriended; during this journey he learns about the importance of self-sacrifice, self-reliance and friendship. "I will help you prepare yourself for the dangers that lie ahead." Those words and Lord Ganesha's appearance in a dream ring ominously in fourteen-year-old Tarun Sharma's mind as he and his family travel to a festival celebrating the elephant-headed god. The Temple Wars, represents yet another brand for Rohit Gaur, who has started brands such as the Gaur Hotels; Gaur Spice Whiskey; Calvary Bourbon; Beautora.com, Artisna.com, and Perfumora.com, a marketplace with a focus on scents. Reviews for Ganesha’s Temple have already come in, painting the book as an imaginative coming-of-age story and able to mix folklore with the realities of today’s real-world conflicts. Its cultural portrayals, mythological, political connotations, and antiwar message are being highly regarded. Various Hindu religious themes are explored as well. Reviewers have also said the book explores themes in a way many American readers are not used to, so the novel opens new avenues of adventure and wisdom. Rohit Gaur is a serial entrepreneur and author of the Temple Wars book series. He has built several brands including the Gaur Hotels, Gaur Spice Whiskey, and Cavalry Bourbon. He is the founder of Artisna.com - the artisan marketplace™, Perfumora.com - the scents marketplace™, and other tech startups.